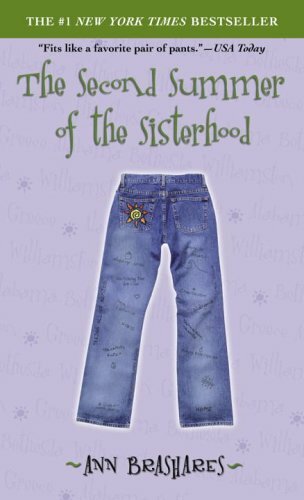 Years ago, whenever it first came out, I saw the movie The Sisterhood of the Traveling Pants, and thought vaguely that I ought to read the book. Much more recently, I was hunting for a new audiobook, and my library chanced to have the first book of Sisterhood by Ann Brashares (read by Angela Goethals) sitting on the shelf—so I listened to it, and then went on to listen to the other four books in the series too. The series centers around four best friends, Carmen, Lena, Bridget and Tibby, whose mothers met during maternity yoga classes. All born in September, they have been the closest of friends ever since. The summer before they turn sixteen will be their first significant time apart—and right at that time, a pair of blue jeans comes into their lives, which mysteriously fits all four girls perfectly, despite their different shapes and sizes. 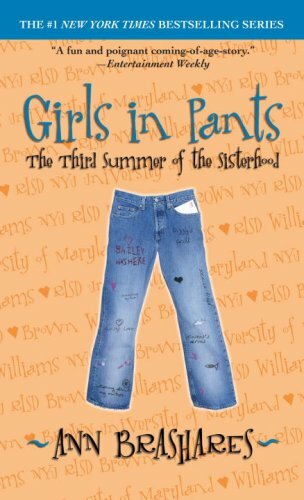 The girls exchange the pants throughout the summer, using them as a way to stay bonded while they each pursue separate adventures. The first four books follow the same pattern, each covering one summer, while each girl has her own plotline. The pants are always there, but to large extent they fade into the background in the later books—which was all right, because by then I was attached to the girls and their friendship. I don’t usually read real world books about teenagers—I get fed up with boyfriend drama and school assignment crises. I think this series worked for me because there were multiple plotlines (so some boyfriend drama didn’t mean all boyfriend drama), and because the friendship at the center of the book appealed to me. Brashares manages a nice balance of sending the girls on separate adventures yet keeping their friendship with each other at the forefront too. All four girls have strengths and failings, and they support one another even as they find their individual paths. Blonde-haired Bridget is wild and impetuous, driven in a sometimes dangerous way. My favorite Bridget-plotline was in Book Two, when she visits her maternal grandmother, trying to find answers about her deceased mother. Her other storylines did tend to be boyfriend drama, although they were really more about Bridget learning about herself and coming to terms with her own recklessness. Carmen is feisty and warm-hearted, deeply loyal and not as secure as she pretends to be. For the first three books, her stories center around her family, as she deals with her divorced father’s unexpected remarriage, then her mother’s new romance, and finally a new brother on the way. Family dramas appeal to me more than boyfriend dramas—and like Bridget’s stories, Carmen’s are really more about her own crisis of identity caused by the changes around her. I liked best her plotline in the fourth book, after a year in college as she struggles to define herself away from her friends, and has to overcome a particularly bad crisis of confidence. Tibby is snarky and tough and secretly much more sensitive than she pretends to be. She aspires to be a filmmaker, but sometimes questions her direction—as well as a slowly-growing romance with a friend-who’s-a-boy who eventually becomes a boyfriend instead. Tibby’s best plotline is in the first book, when she meets Bailey, an equally snarky twelve-year-old, who turns out to have an incredible wisdom and insight into people. Of all the girls, Lena is my favorite. Quiet and self-contained, Lena is afraid of being seen and afraid to take risks. She struggles to find the courage to pursue her dream of being an artist, and to pursue Kostos, her first love with whom the path of romance does not at all, ever, in any way, run smooth. In some ways Lena has the most complicated inner journey, and I feel like it’s one that I don’t see often in fiction. She throws her own barriers in the way of her goals, and while some factors are external, the more profound ones are internal. The situation is complicated (and more interesting) because I thought she wasn’t always all wrong. It can be a delicate balance between sensible caution and hiding from life, and I appreciated watching Lena try to navigate it. Book Four ends with what could certainly be a series end. Not all the threads are tied off but many are, at least to the extent of leaving the girls in a place of hope for the future, if not quite a resolution. If you really want answers on “what happened next,” there is a fifth book…but I warn you that not all the answers are happy ones. I did go on to the fifth book, and for the most I’m glad about it—but it’s such a separate entity from the others that I think it needs its own review. And how about that movie that started me on all this (if quite a while ago)? Well, I went back and rewatched that too…but that will also be another review! I’ve never read the books, but I do remember the movie – vaguely – as taking place, at least in part, in Greece. Beautiful scenery. I remember it did feature all of the girls in separate plot lines that also came together. The books sound much more in-depth (as is usually the case between a book and movie version of the same story) about each of the four characters, which would be interesting to explore.